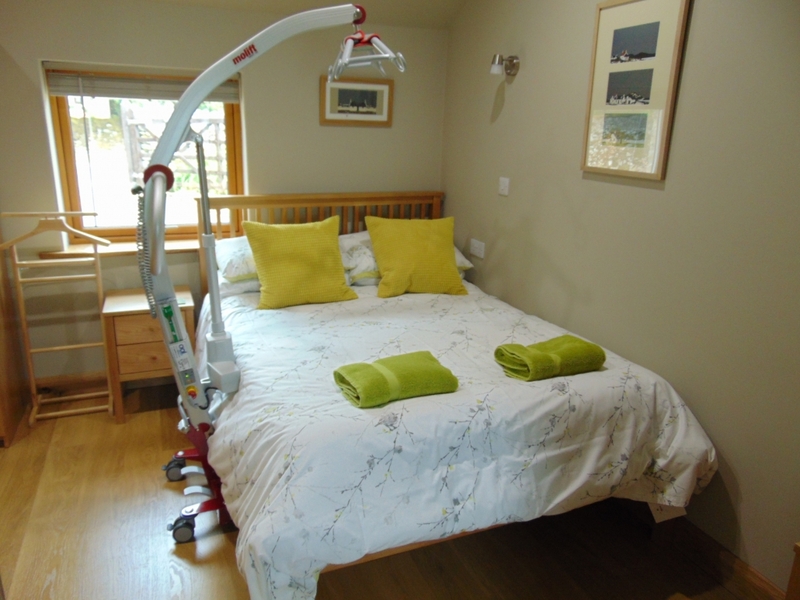 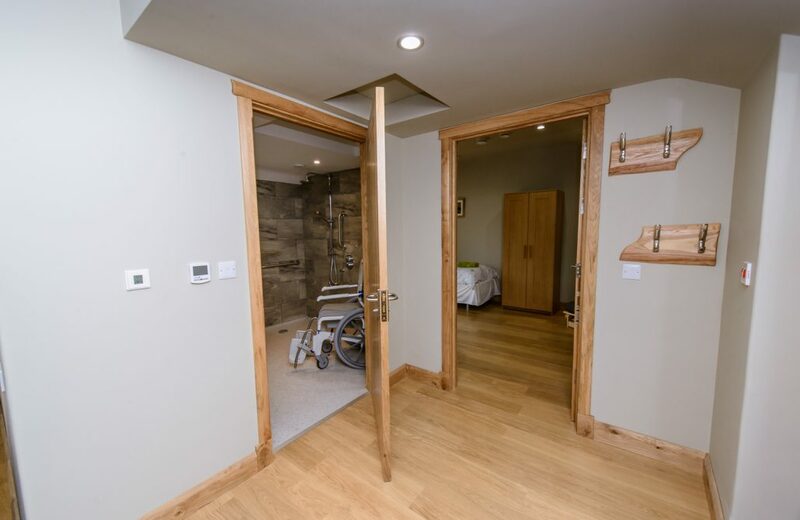 Newly open in May 2017, Hope Cross is a fully accessible ground floor cottage for guests with a range of disabilities from mild/moderate to more severe. 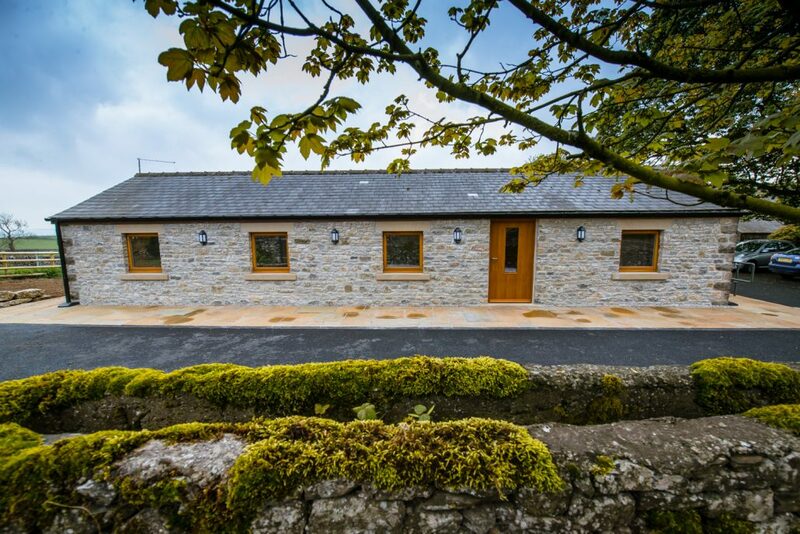 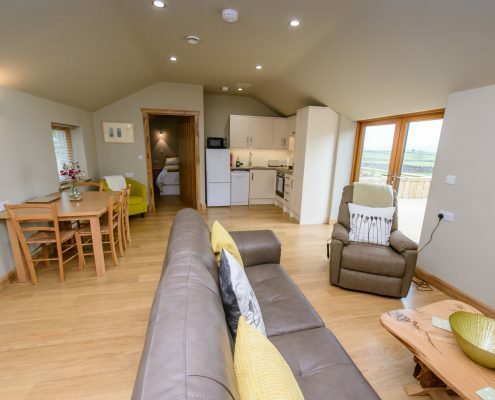 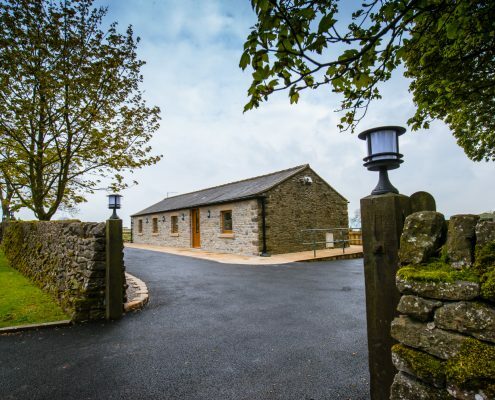 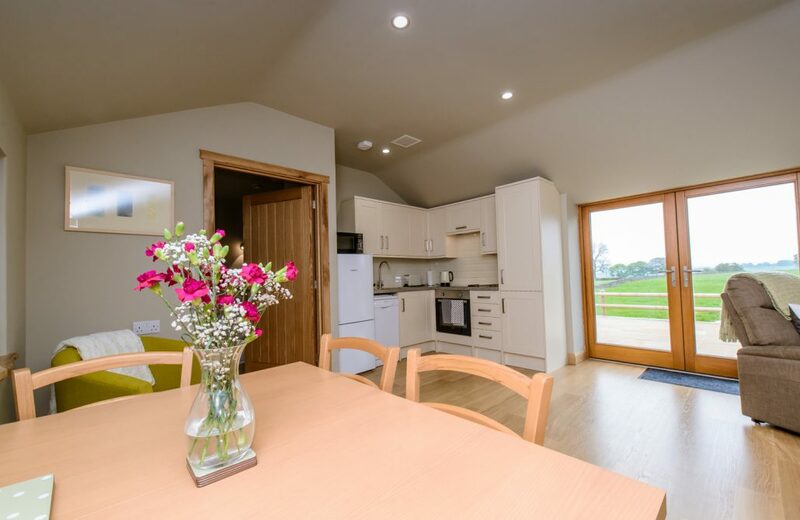 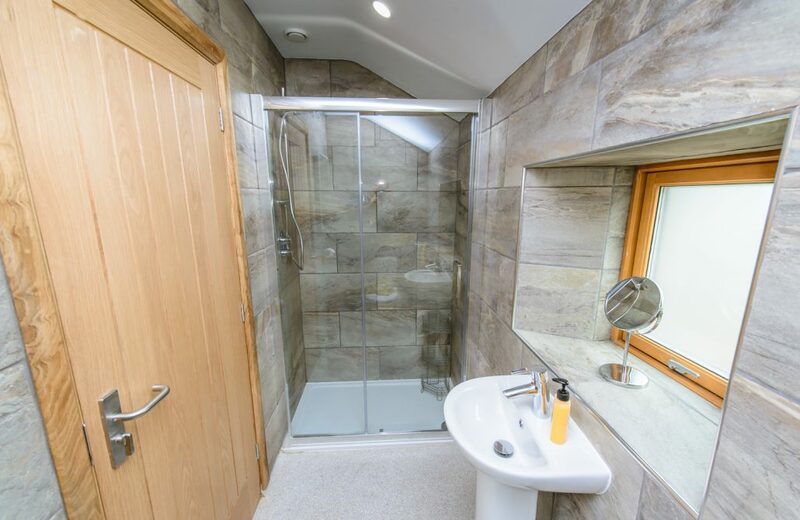 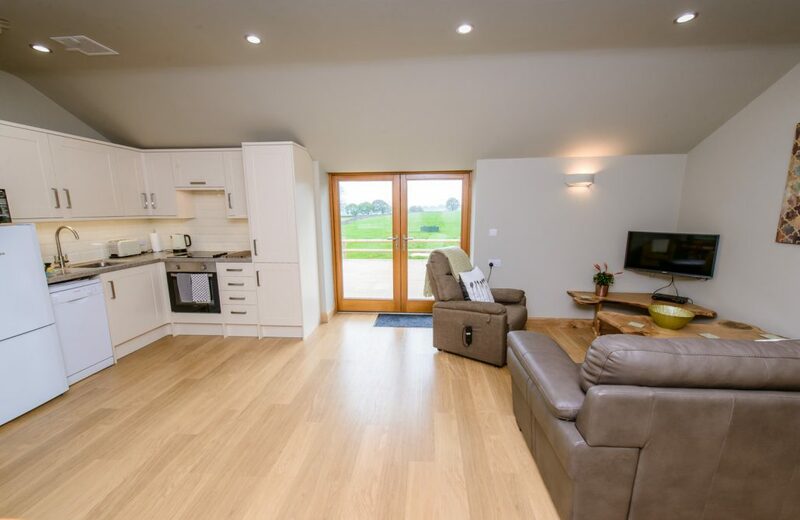 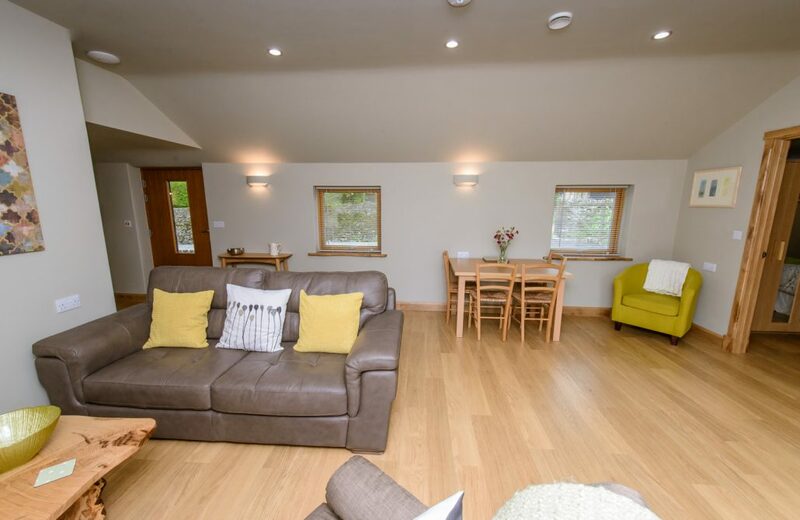 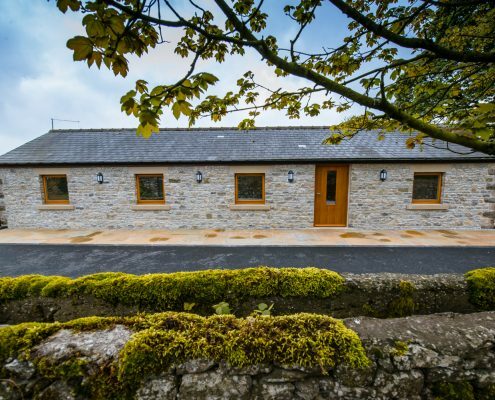 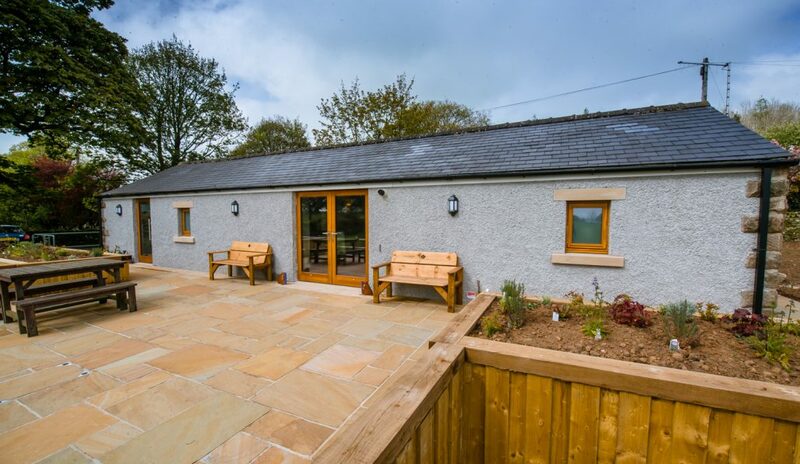 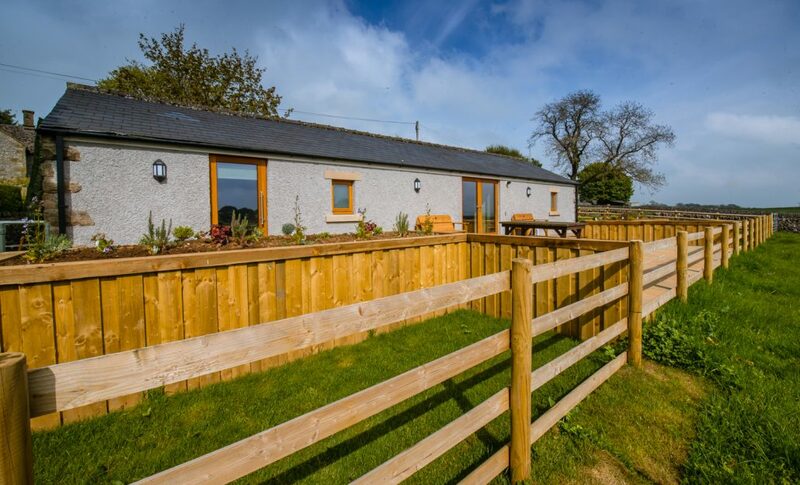 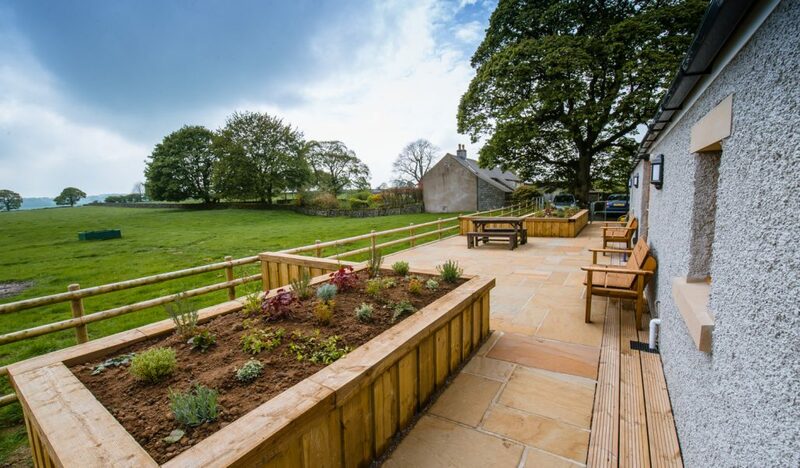 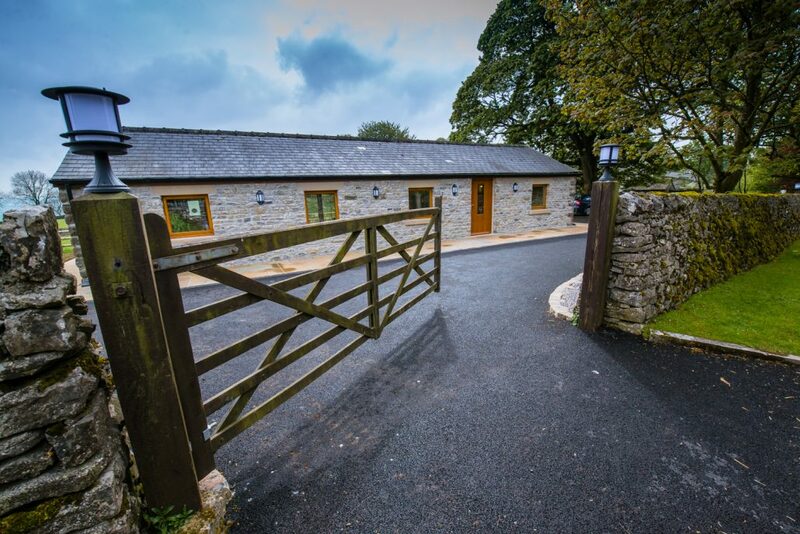 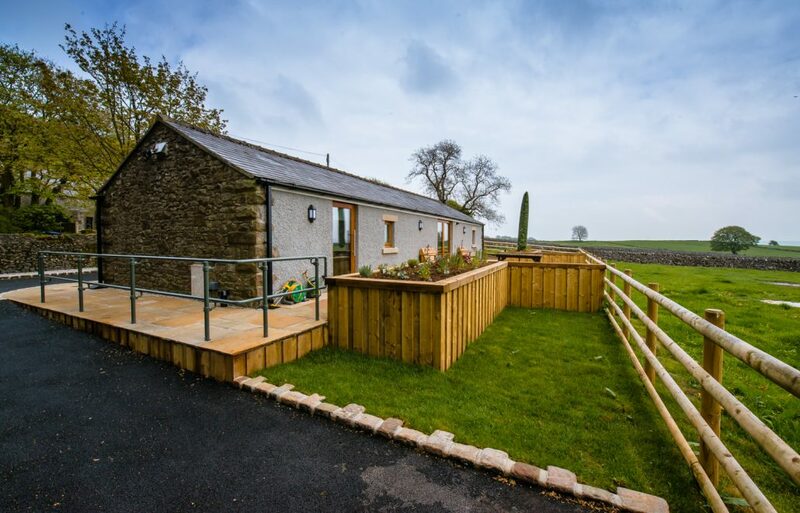 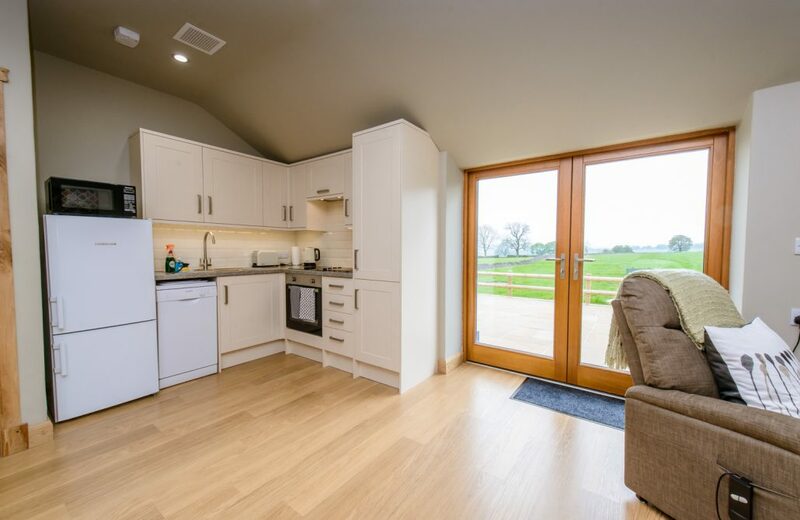 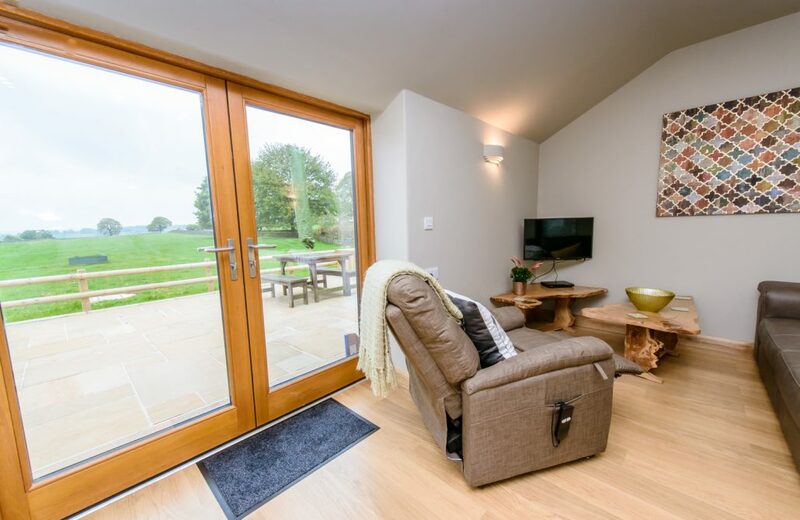 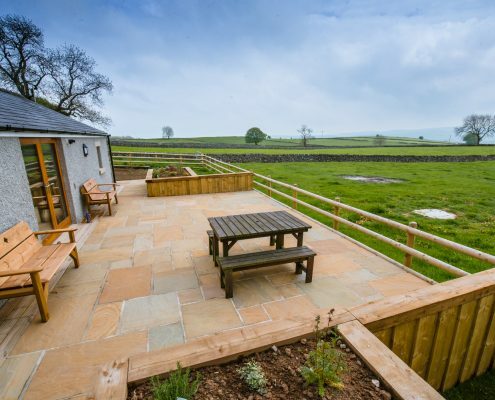 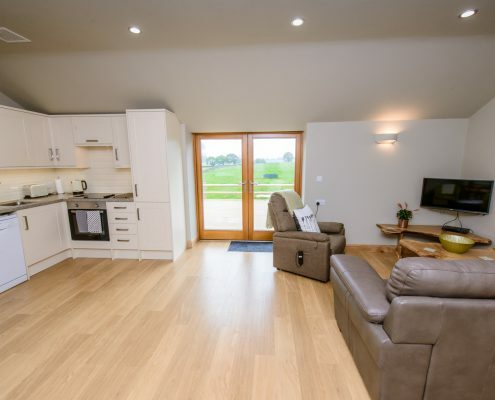 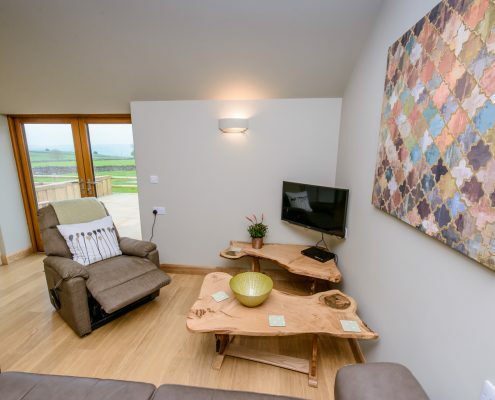 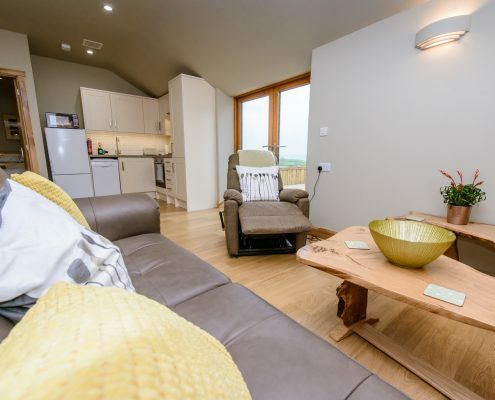 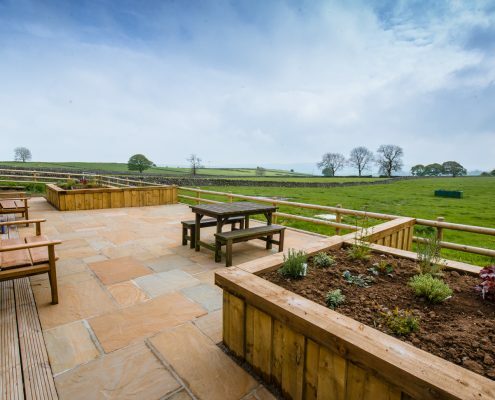 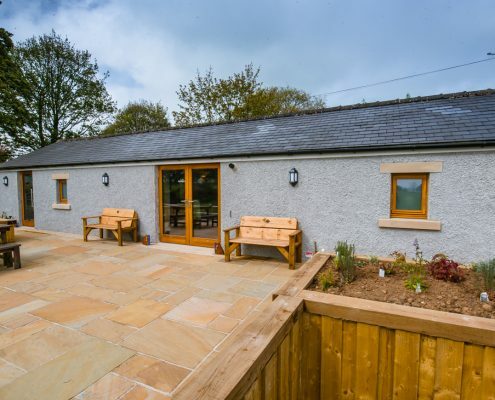 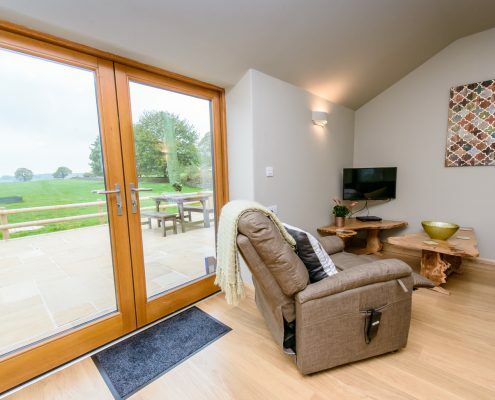 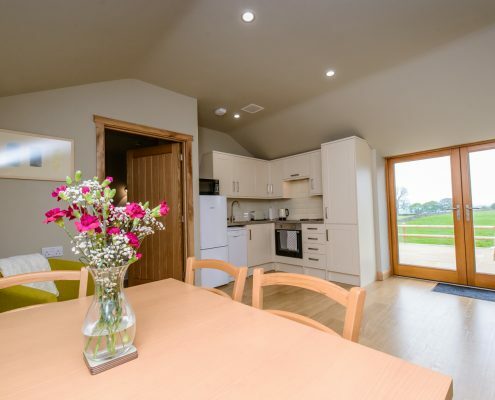 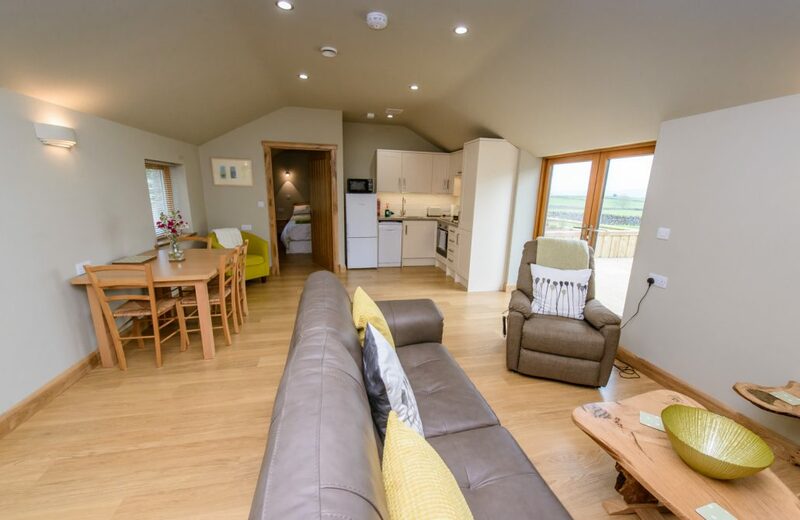 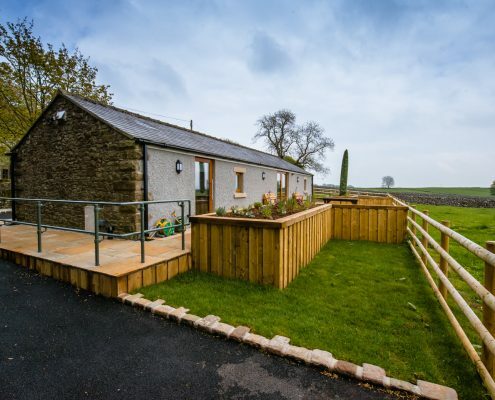 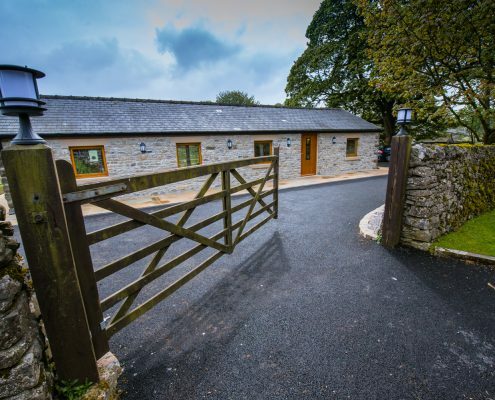 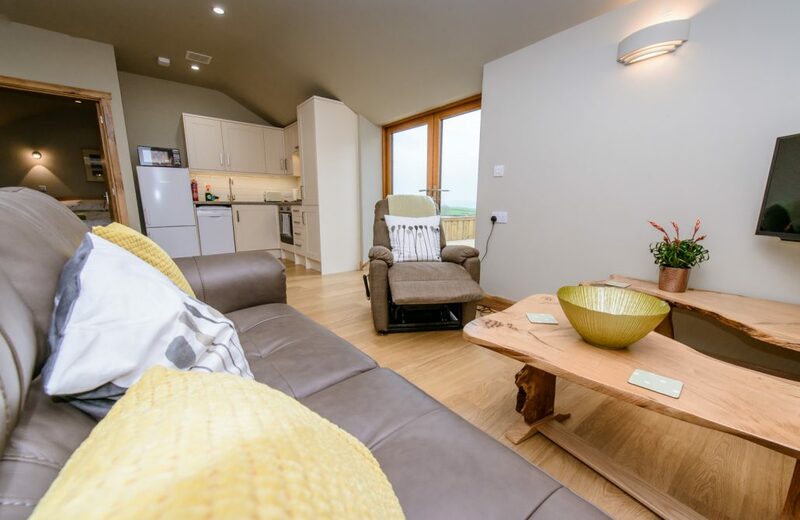 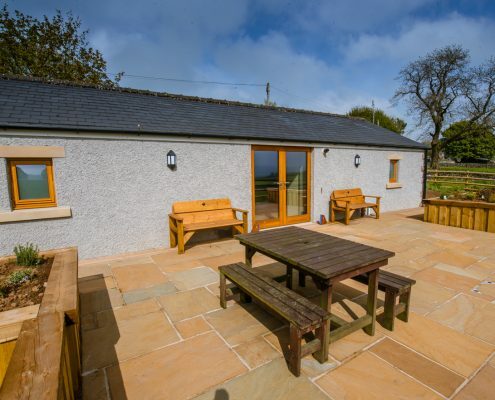 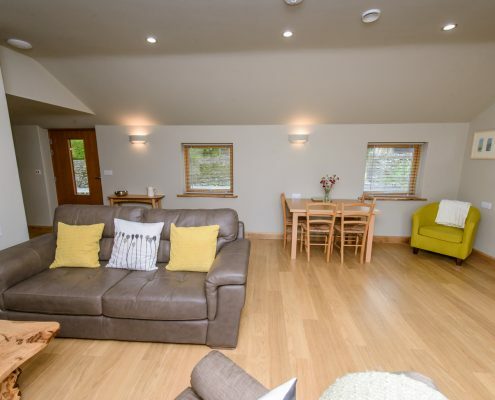 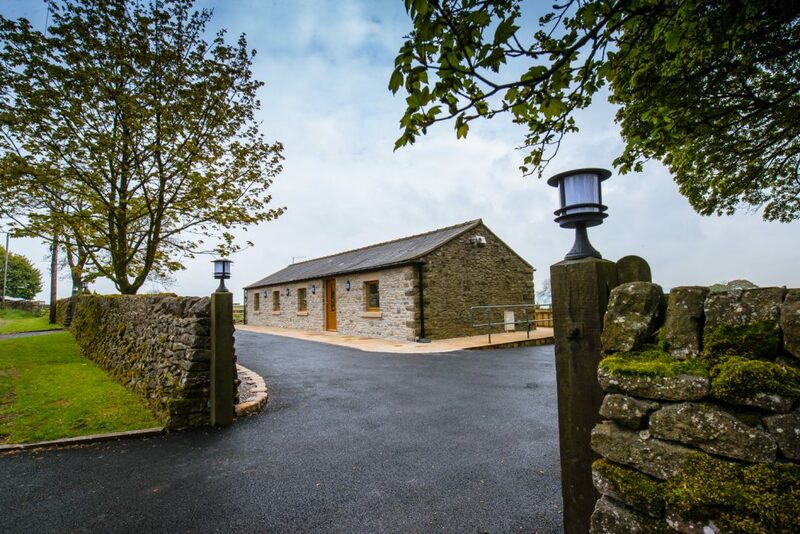 Designed specifically with disabled visitors in mind, it sleeps up to four guests and has a spacious lounge/dining area/kitchen opening on to a large patio with glorious views over fields and dales. 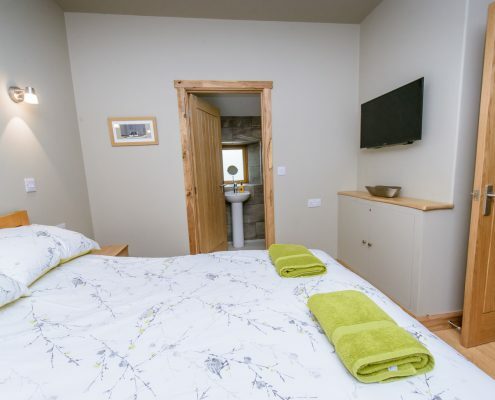 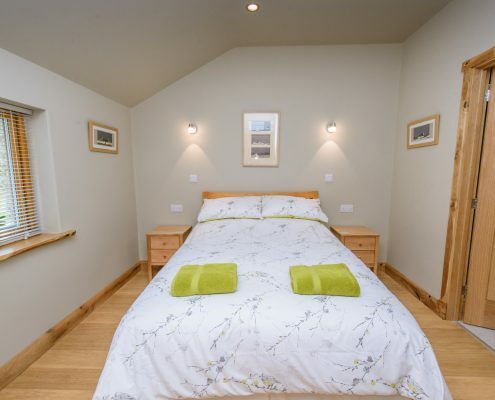 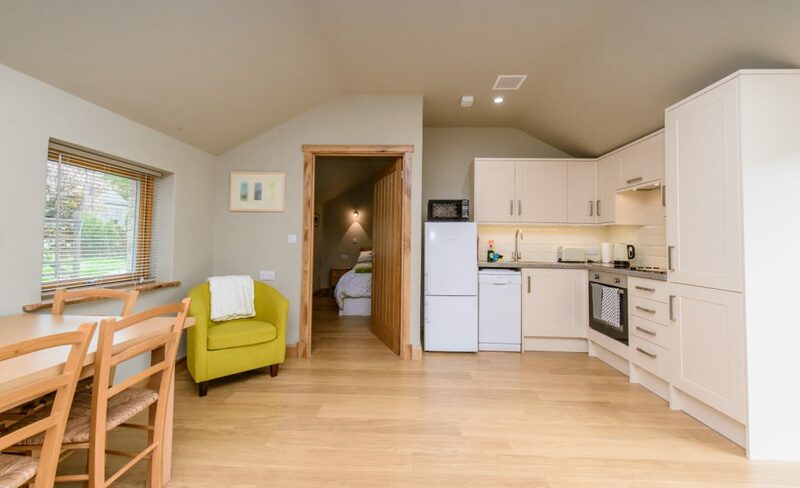 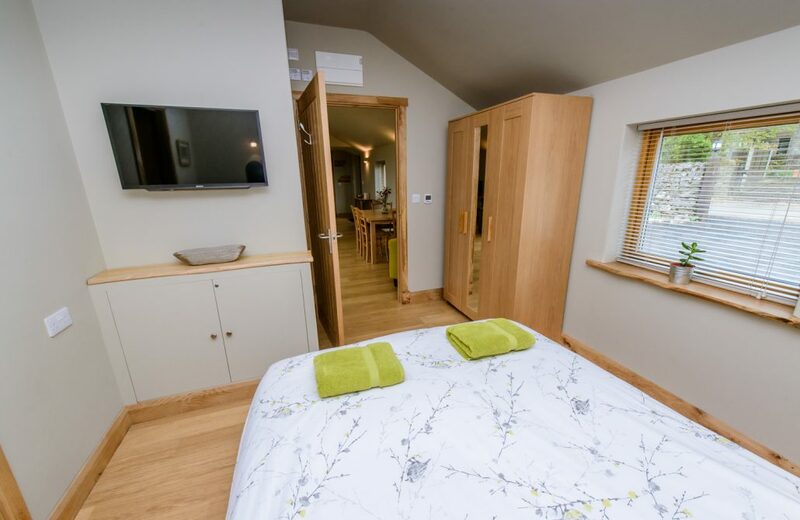 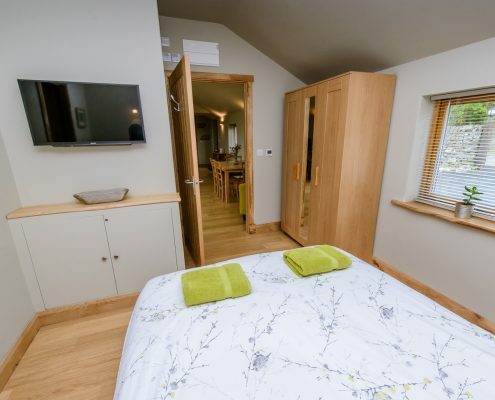 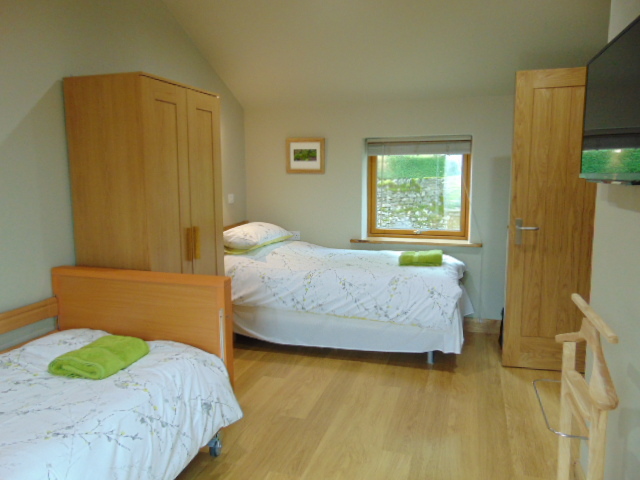 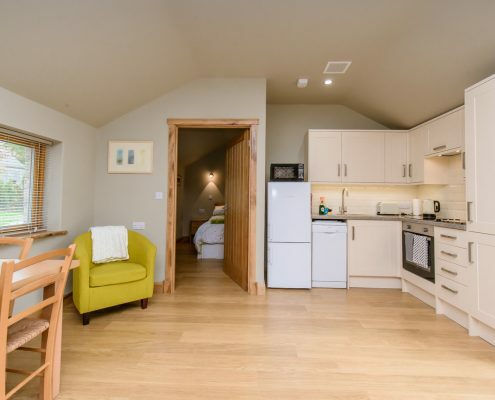 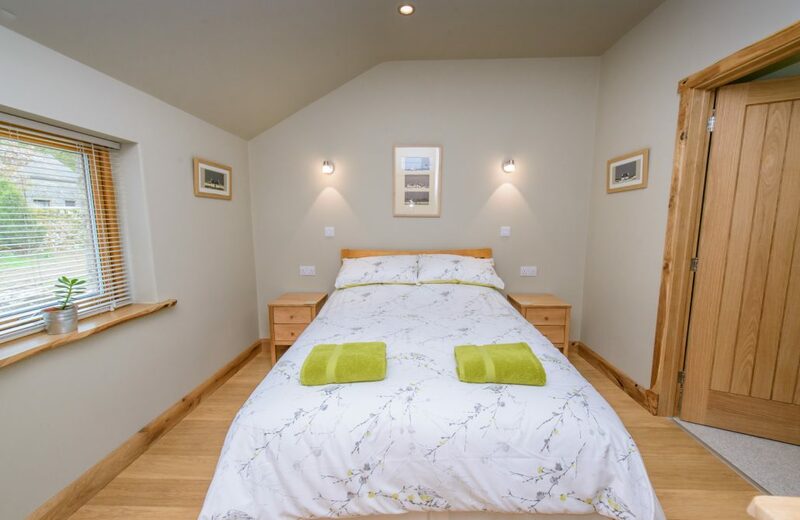 The cottage has two bedrooms – one double with en suite shower room, and a twin with profiling bed and electric tilting bed with optional guard rail & bed raisers. 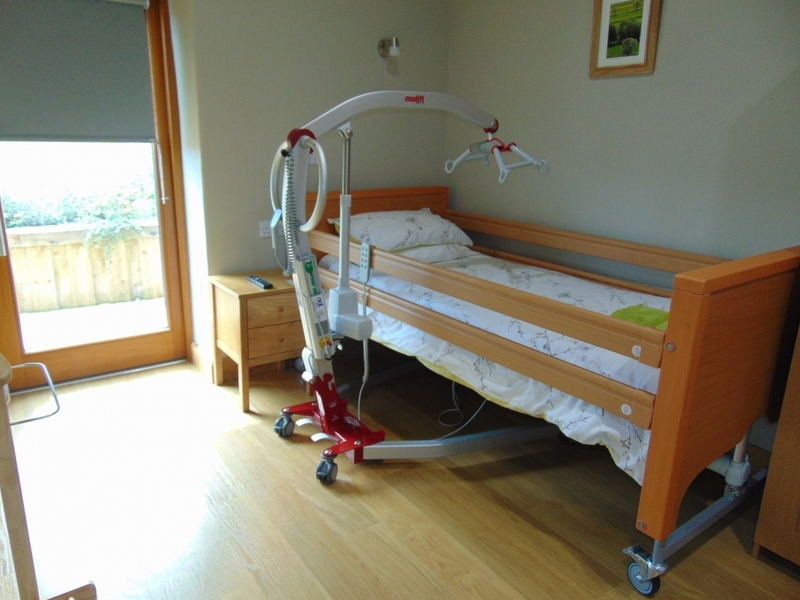 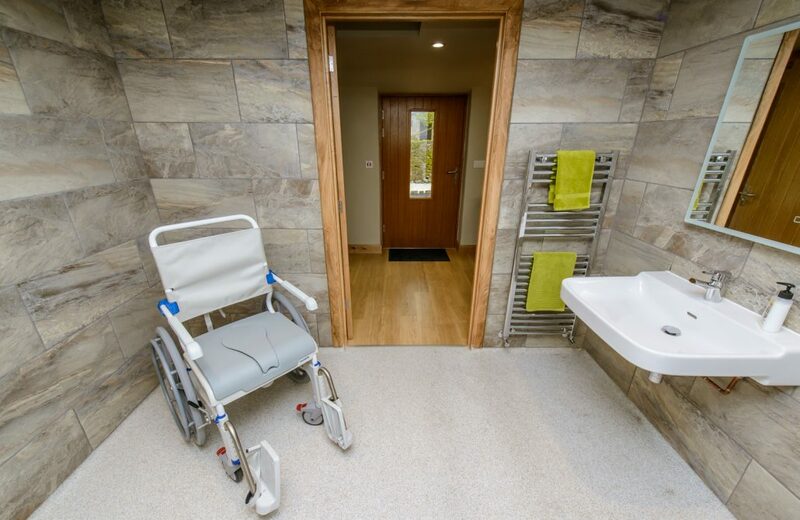 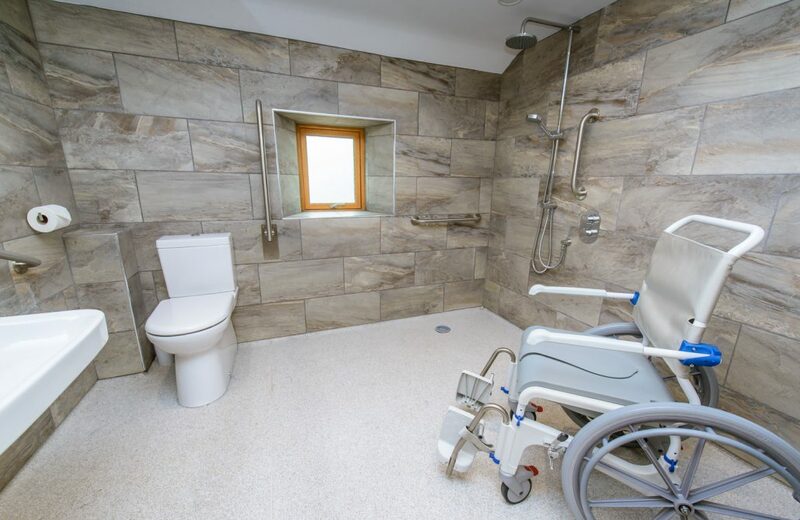 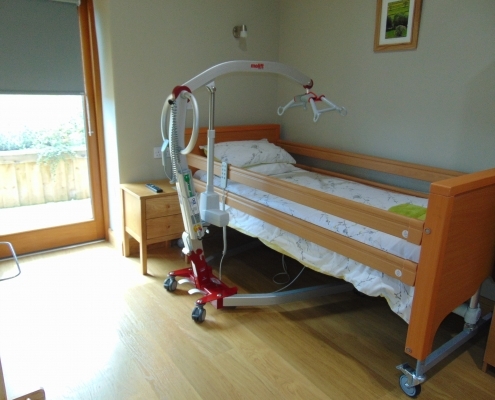 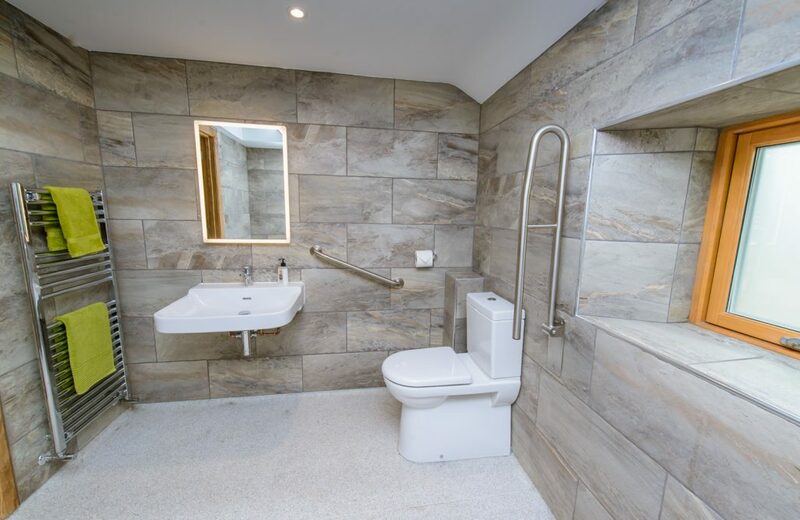 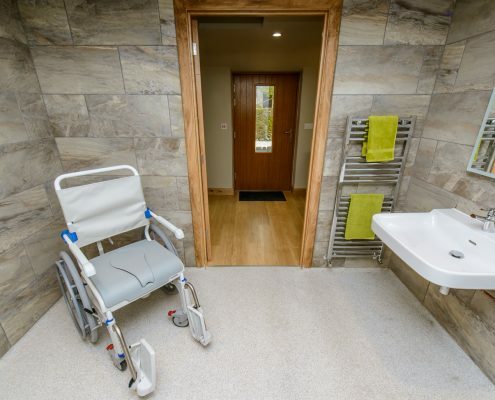 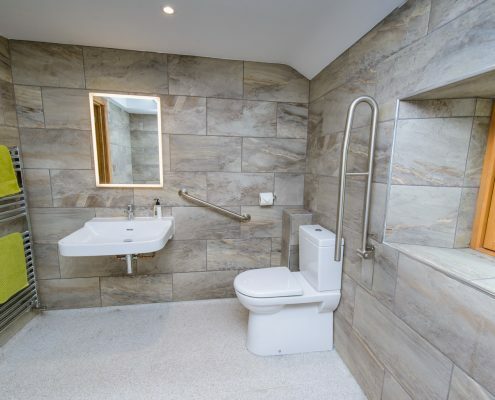 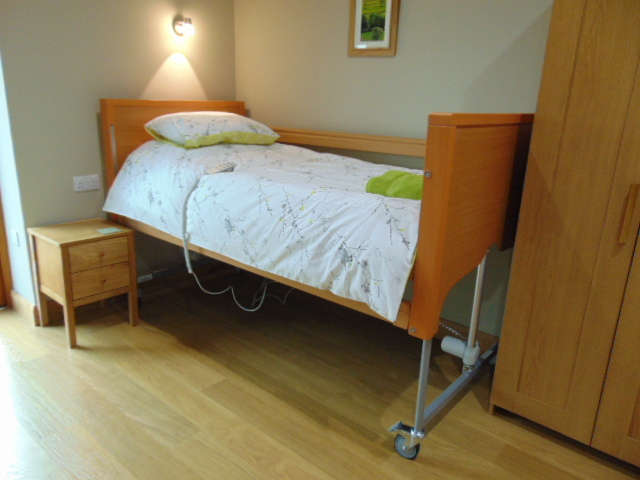 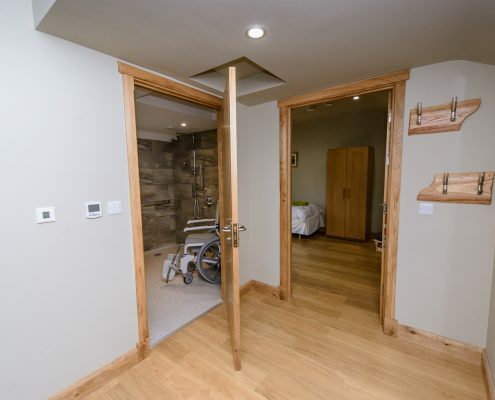 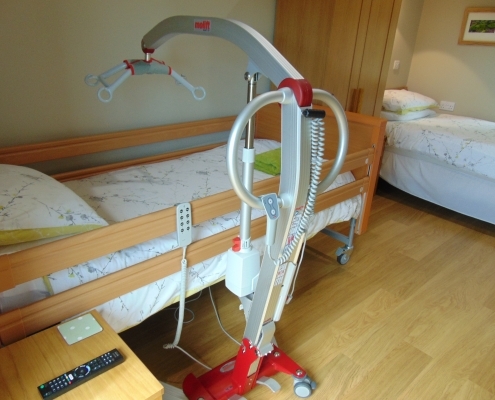 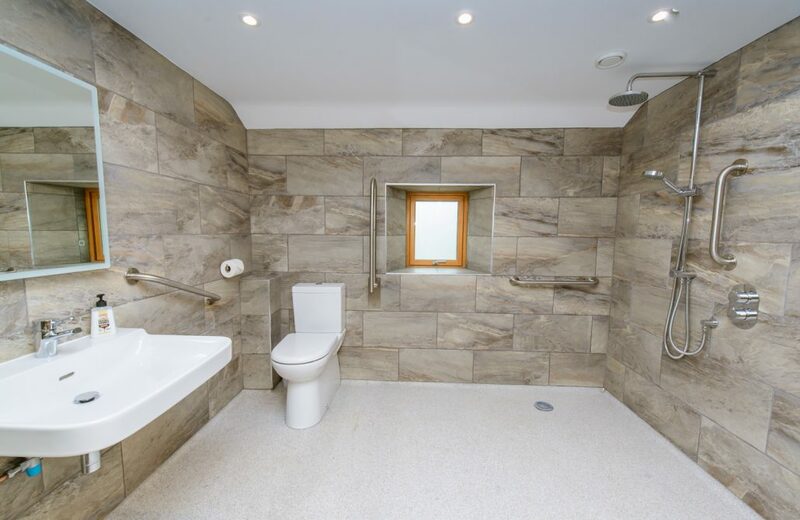 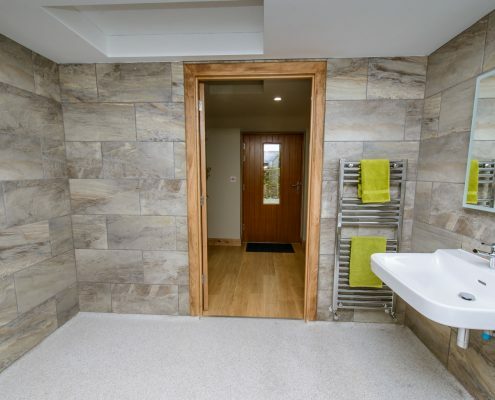 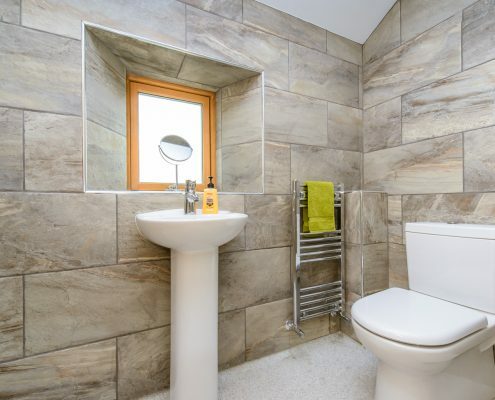 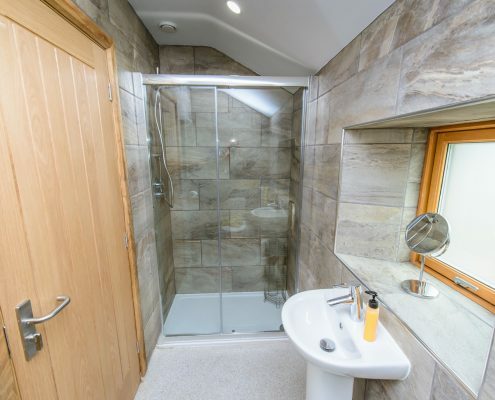 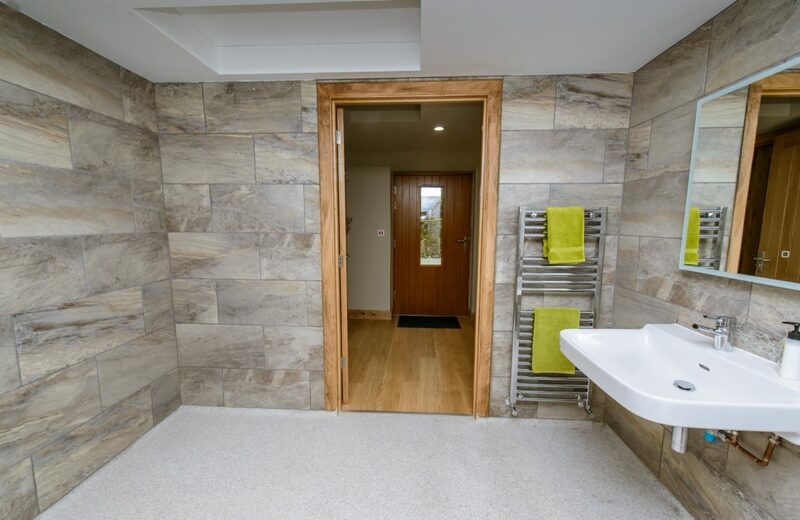 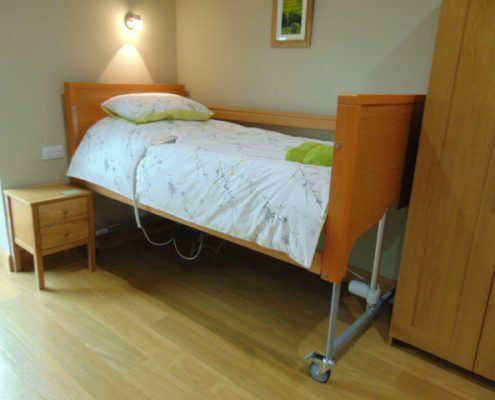 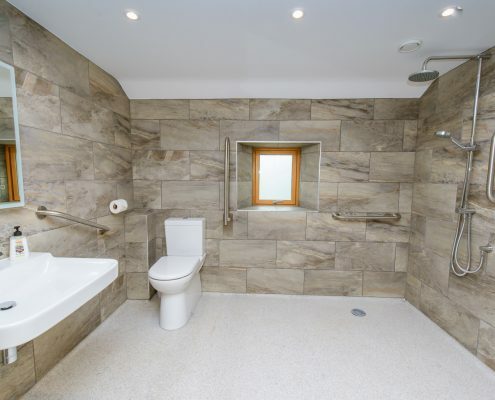 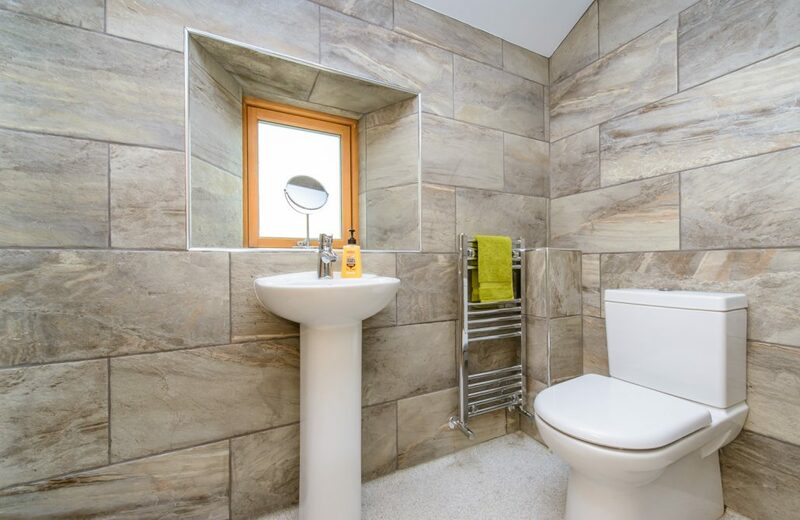 This room has large wet room beside it with a comfort height toilet, grab rails, wheelchair accessible basin and shower with fixed and hand held heads, self-propelling shower chair and non-slip flooring. 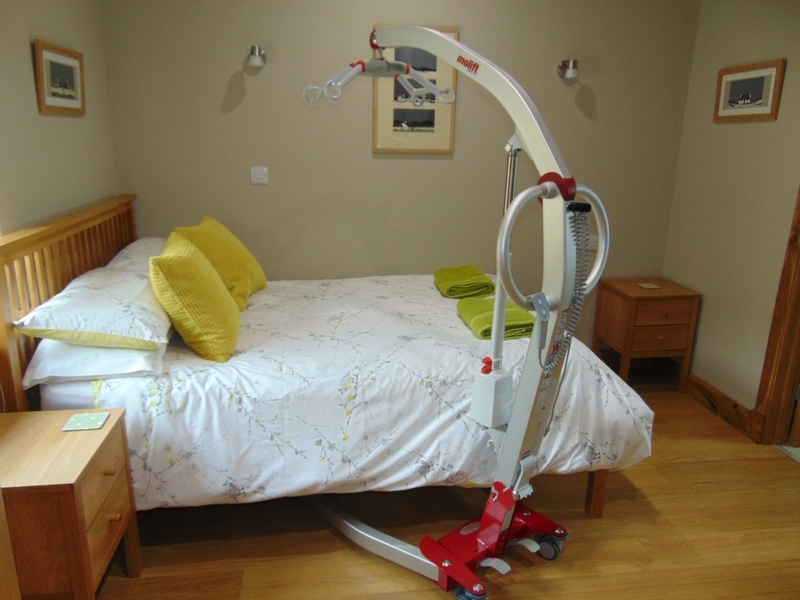 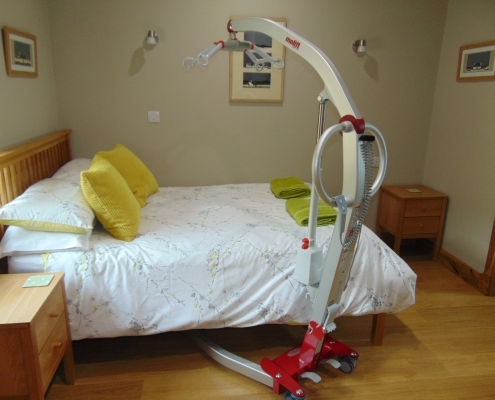 We have a mobile hoist for you to bring your own sling. 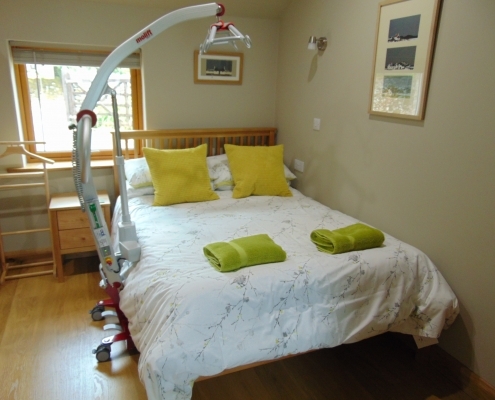 Our duvets and pillows are non-feather to help with allergy issues. 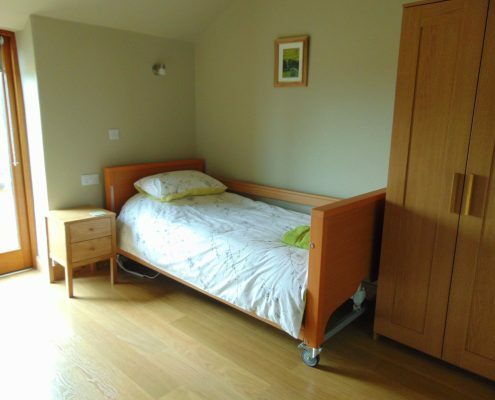 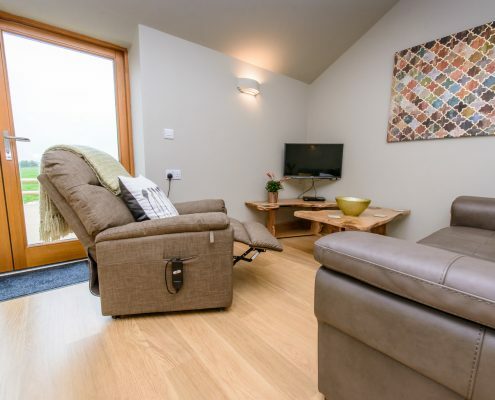 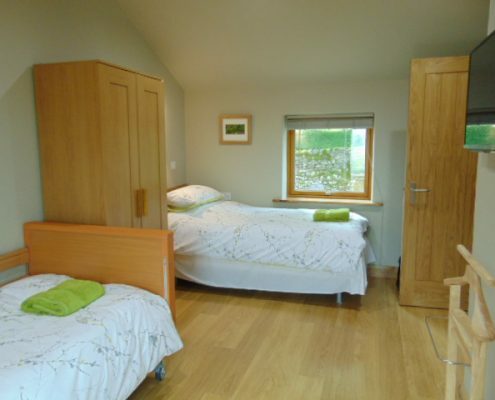 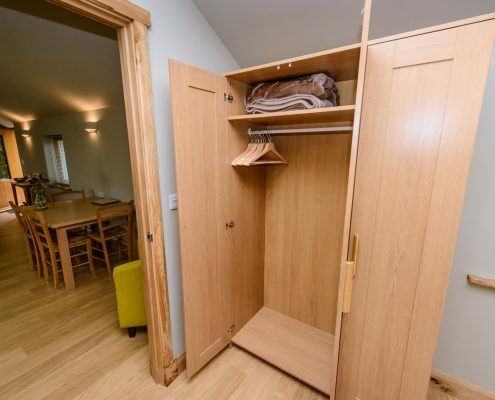 Both bedrooms have wide doors off the lounge area, televisions and ample storage space. 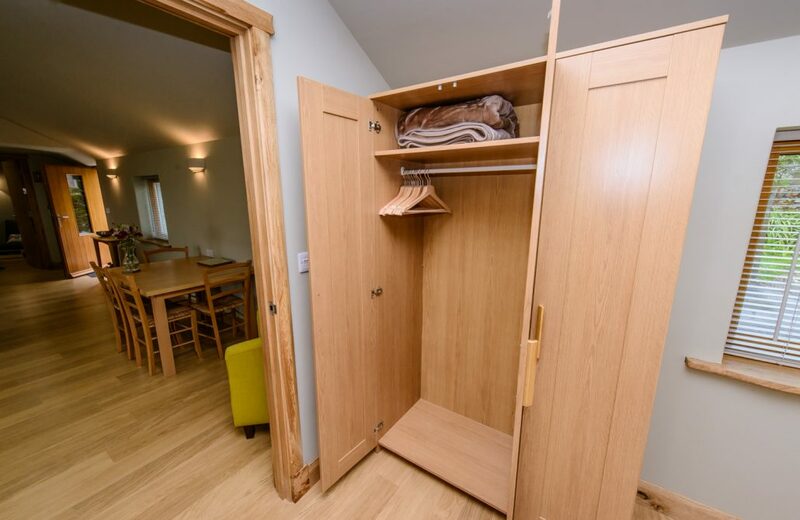 The single bedroom has an escape door to the rear patio which is fully integrated with the alarm system. 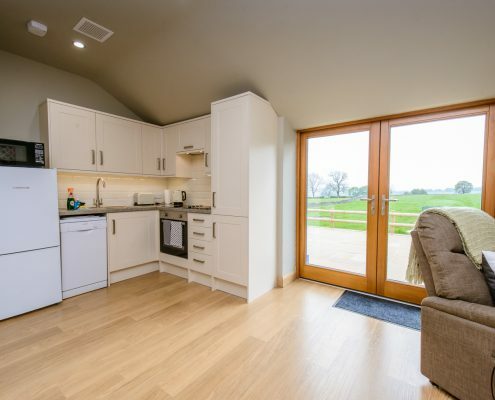 All the doors have low thresholds and easy open handles. 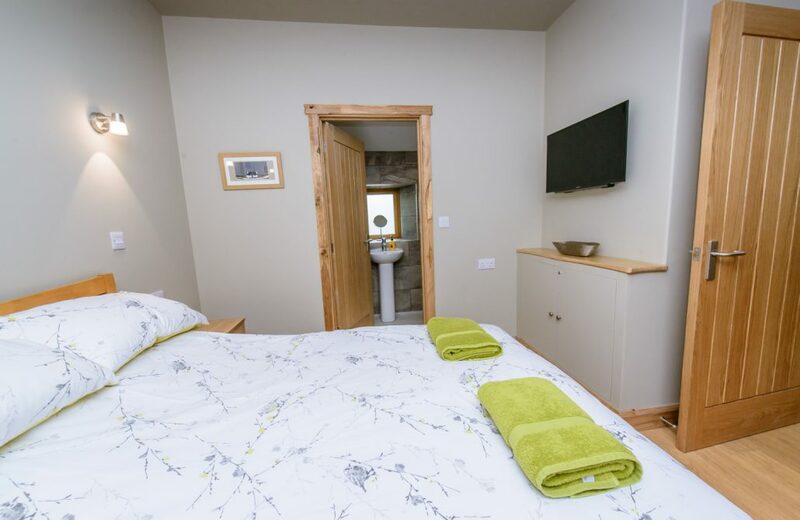 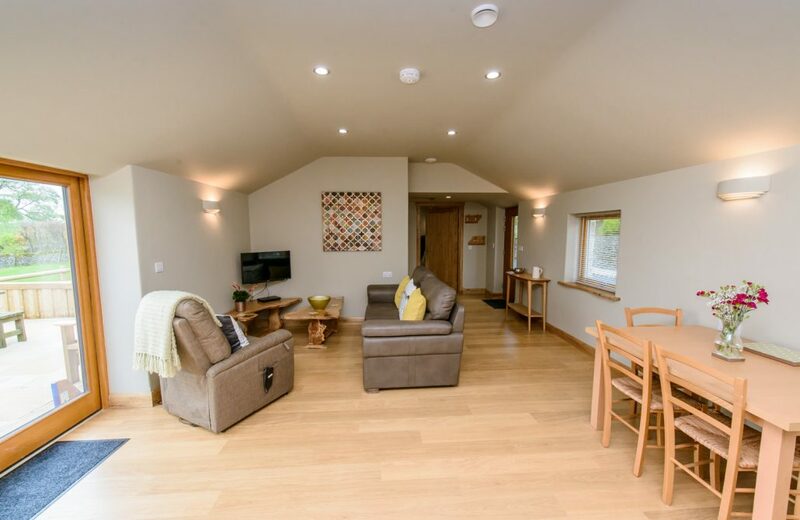 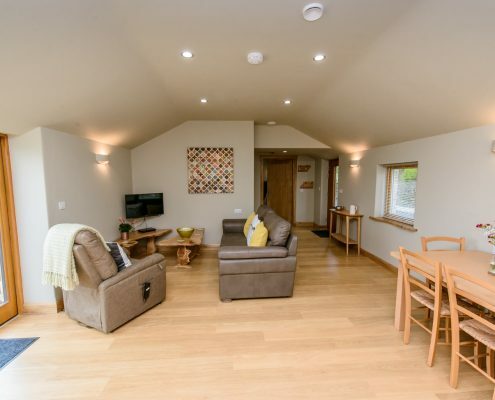 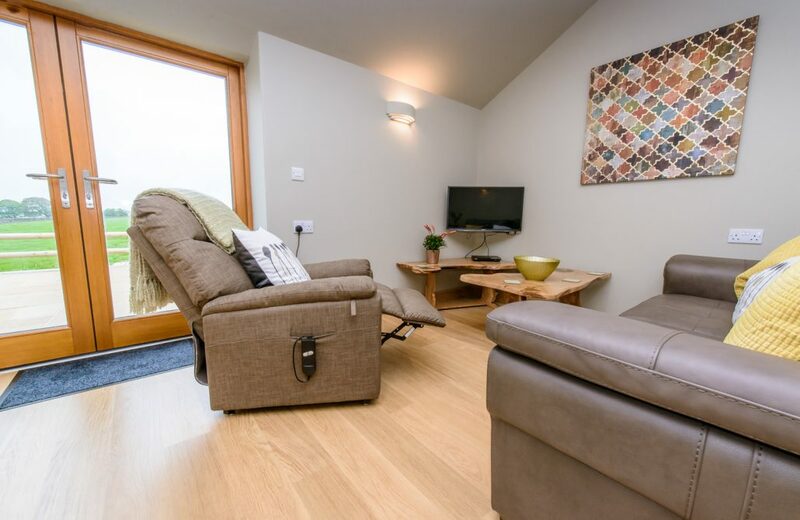 There is underfloor heating throughout the cottage, zoned in the bedrooms for independent control of each room, with fan heaters and extra cosy blankets for guests who need additional heat. 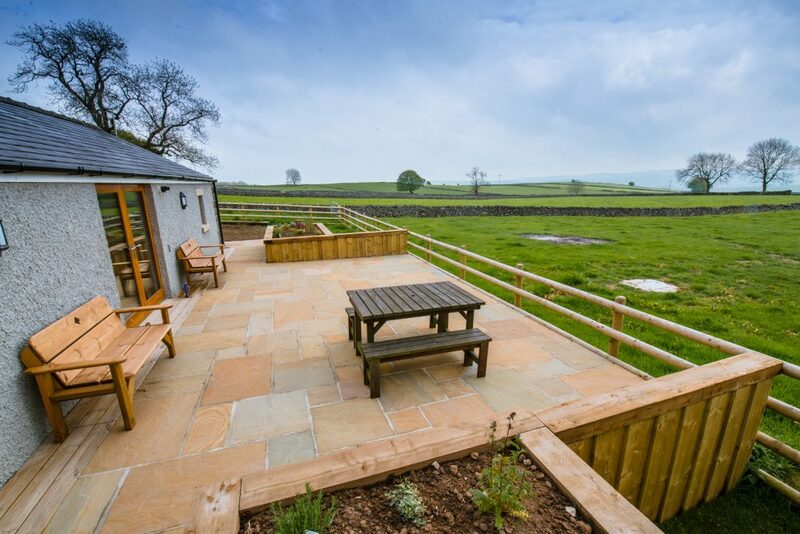 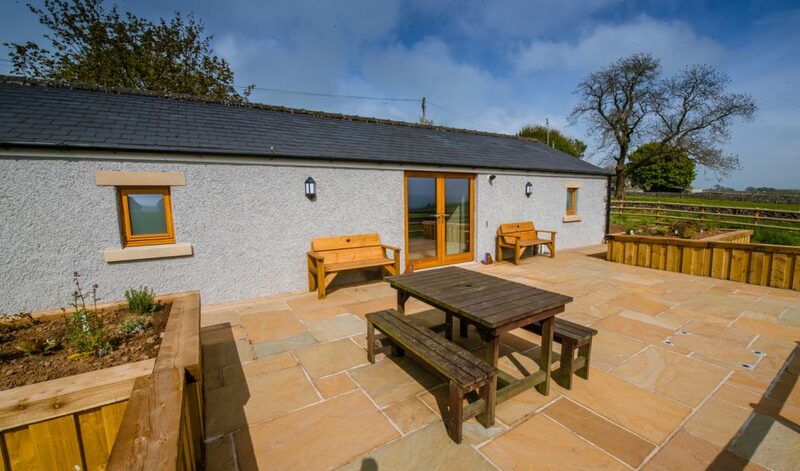 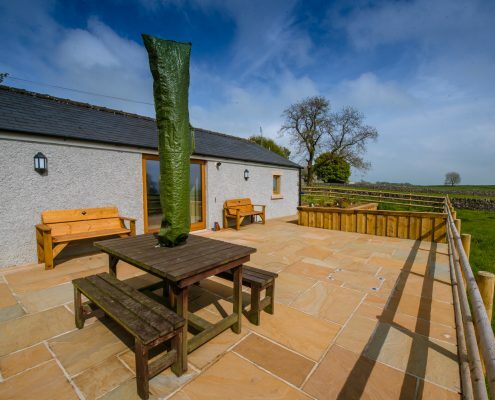 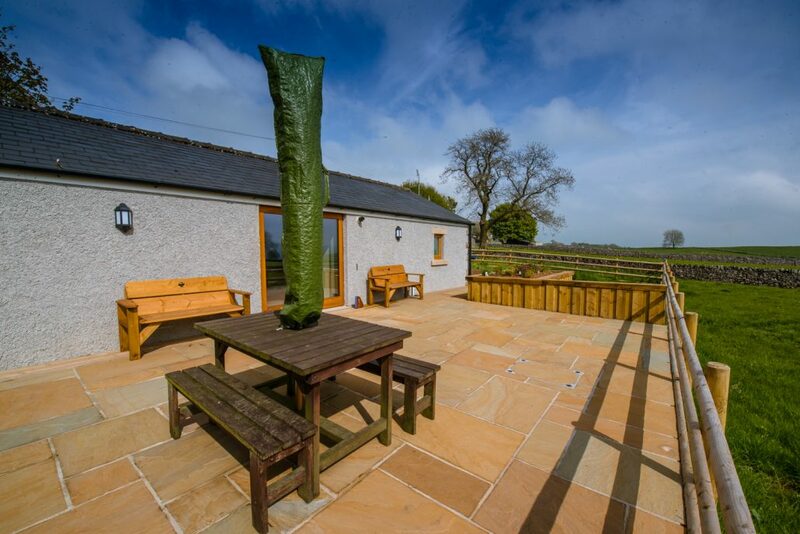 The large patio behind the cottage enjoys uninterrupted views over fields and over towards Miller’s Dale – the only thing blocking your view may be the cows! 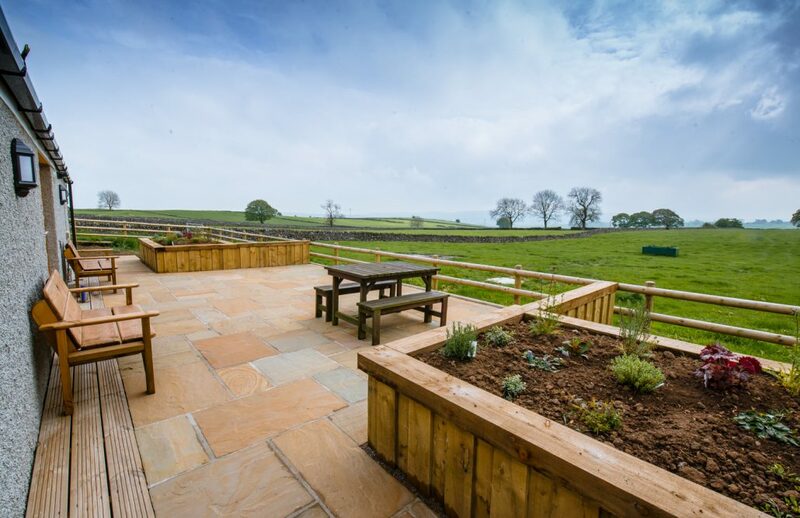 The patio has a dining table with benches and raised beds with a selection of plants chosen for their sensory nature, colour and texture. 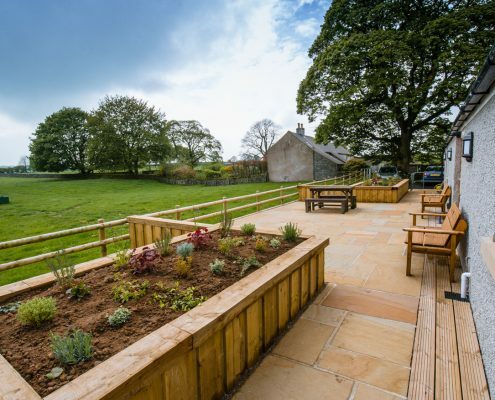 We have installed wide, level paths and lighting round the entire exterior of the building, giving safe and easy access to all areas from the level car park outside the front door. 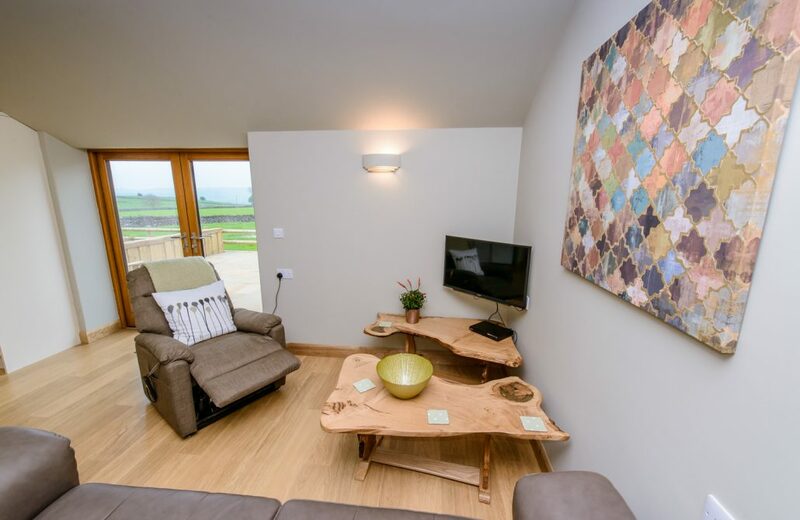 Hope Cross is highly energy efficient with underfloor heating, triple glazed windows & doors, hi-spec insulation and a heat recovery unit which provides continuous fresh air to every room while recovering 95% of the heat generated. 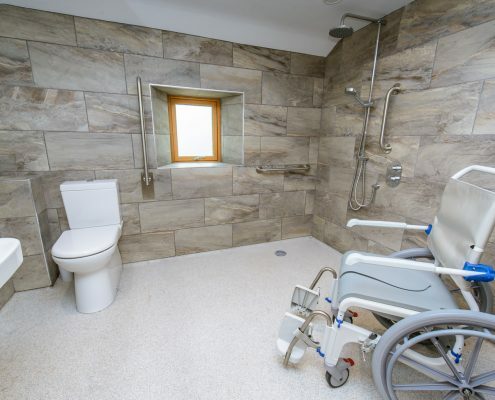 We have an online Accessibility Guide here. 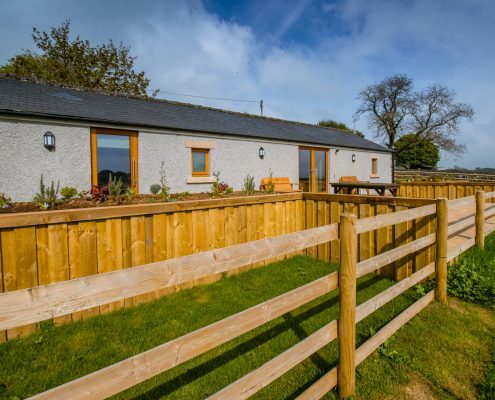 See our guests’ video here Thanks to Chris and Nicoleta for sharing this!